Size: Up to 6 feet in length, slightly shorter than common Nile monitors. Diet: Small animals, such as snails, crabs, fish, small snakes, insects, frogs, turtles, tortoises, small crocodiles, small lizards and the eggs of birds and reptiles. Characteristics: Ornate Nile monitors generally have a dark olive to black skin, with cream-colored or yellow contrasting stripes on their jaws and head region. These stripes break into a row of chevrons running down the animal’s neck. They also have light-colored tail bands. Colors fade as the animal matures, but they are still prominent. 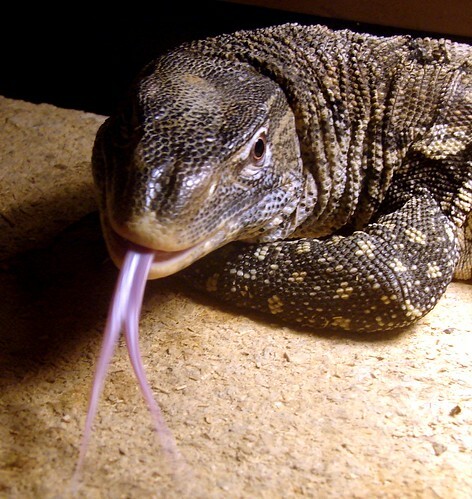 Ornate Nile monitors also have a light-colored to pinkish tongue, whereas common Nile monitors have a bluish-black tongue. Threats: Major threats to this animal include habitat destruction and hunting for the skin trade. Their skin is used for food and traditional medicines while live animals are exported for the pet trade. The first known captive hatching of this animal occurred at the Bronx Zoo in September 1998.